Brewed with El Dorado hops, ATBS in another offering from Maine Beer Co that while familiar, is still a welcome addition to the lineup. The bottle conditioning on Maine Beers produces a lot of head, so it's wise to be a tad more careful in your pouring than you would with most beers. I noticed some significant carbonation coming off the bottom of the glass and the beer itself was a nice shade of orange. It leaves some very nice lacing. A pleasant bouquet of floral, grassy, and herbal aromas comes first. Also getting an orange peel and citrus zest. The taste is akin to acidic grapefruit and again, flowers. I will say that this is noticeably silky on the mouthfeel and finishes dry. Not a bad offering. 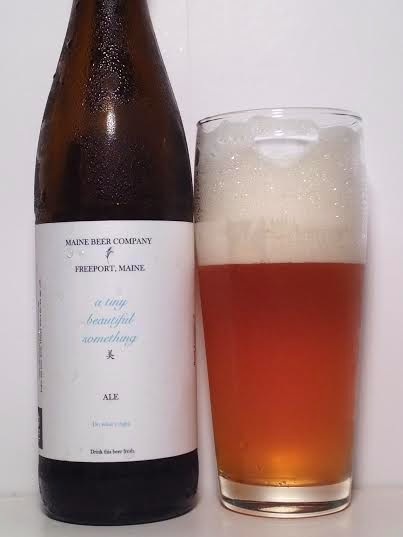 A Tiny Beautiful Something stands out from other Maine Beer offerings for it's silky smooth mouthfeel alone. At 5.50%, even the casual beer drinkers could have the bottle to themselves and ask for more. While it doesn't come to Massachusetts year-round, definitely grab a bottle when you see it.